After leaving education you are now ready to search for a job. But will an employer see you as an attractive prospect if you have little to no work experience? How can you bolster your CV and gain that valuable work experience to prove to an employer that you’re ready for a working environment? Above: An example school leaver CV which can be downloaded here. If you’ve ever wondered how you can gain work experience whilst in education, one of the best ways is to volunteer for a local charity shop or country park. There are always opportunities available, and the hours are often quite flexible. Even just working now and again on the weekend will create valuable work experience for your CV. Voluntary work is also a great way to develop your soft skills for when you enter full time employment. Although you will have picked up a few skills whilst in education, it’s never quite the same when comparing it to a working environment. Working in a busy work place, interacting with colleagues, talking to customers, solving problems, customer complaints, and much more – these are just a few examples of a normal day at work. Depending on the type of voluntary work, you could be learning how to use a till, serving customers, dealing with transaction, stock taking, stock organising, and so on. You can quickly see how valuable this work experience would be to your CV and a future employer. A common misconception a school leaver will make is that they don’t have hardly anything to put on their CV, and that their education will be a simple list of subjects and grades on their application. However, there is much more you can expand upon to show an employer that you have already been building up your soft skills ready for employment. Think about all the assignments that you had to complete for a certain deadline. Demonstrating how you always consistently met those deadlines instantly shows that you have great organisation and time management skills. Did you ever miss a day of school, college or university? Having a fantastic attendance record should go on your CV to show dedication and commitment. Depending on the role you’re applying for, you can always use your education to highlight the relevant skills an employer is looking for. If the role you’re applying for relies on good team working abilities, look back over you time in education and find any instances where you had to work as part of a team. Go into detail as to what the project was, what your role was, and what part you played in making the project a success. Your achievements in education don’t just boil down to a list of results on your CV, and an employer will gain a better understanding of what you can bring to the table if you go into more detail. 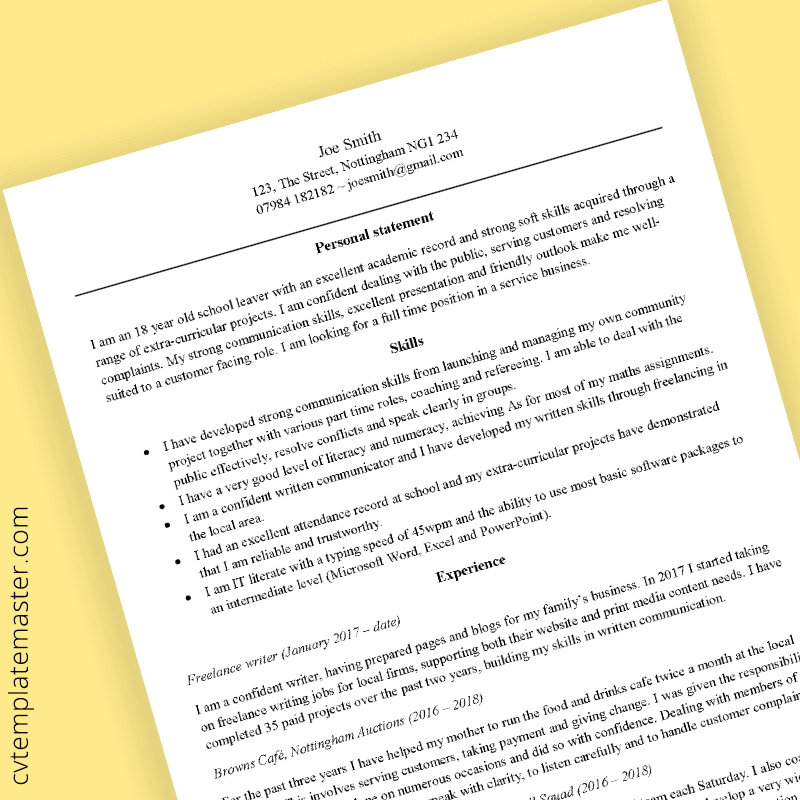 You could even consider attaching examples of your work, which would not only show off your researching and writing skills, but would also add another dimension to your CV. An employer is well aware that when they advertise an entry level position, they are going to receive lots of CVs from recent school leavers. You need to consider how you can make your CV stand out from the crowd, and by showcasing your assignments, achievements, projects and presentations, you are clearly proud of what you’ve accomplished so far and are making the point of showing how you’ve already been developing your soft skills for a working environment.